Looking for the Galaxy Tab A 10.5? Make peaceful car journeys a reality with Kids Mode 4.0. It's an app that keeps the kids entertained, with games, kids' camera and 3D characters. And the content isn't just fun and free – it's safe as well. You can set limits on how long they play and even manage what content they're getting onto. So you can keep your eyes on the road without worrying about what the kids are getting up to in the back. With Google Play Music, you can upload your music and listen to it anywhere. So it's perfect for when you want to get in the mood for a night out, need to make a playlist for you next party, or just fancy showing off your great taste in music. And you can get access to thousands of songs to stream on demand. The Galaxy Tab A 2016 10.1 helps you look after your eyes, with its anti-glare screen. It automatically adjusts the screen brightness in low light, so you don't have to squint or strain when you're using it outside. 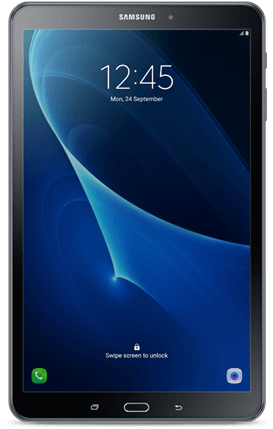 The Galaxy Tab A 2016 10.1 is as mobile as you are. It's 4G enabled, so you can watch movies on the train, check your emails on the go or let the kids play games while you're waiting for your flight. And you don't have to worry about running out of power either. It comes with a powerful 7,300 mAh battery, to give you up to 12 hours of video playback.